MY ALL TIME FAVORITE EAGLES!! WHO ARE YOURS? Since we’ve been spending a good bit of time covering the Flyers and the 76ers as they head down the stretch in their respective regular seasons and we’ll be covering March Madness and doing a player-by-player analysis on the Phillies 25 man roster beginning very soon I thought we’d take a quick break and jump back to the E-A-G-L-E-S since they never move too far from the center of our thinking anyway. Today I have picked my 12 favorite Eagles of all time. Obviously, this is open for great debate. I’ve picked these guys for a number of reasons and some just because I liked them. It was actually tough to get down to just 12. Now as a clarification I never saw Steve Van Buren, Chuck Bednarik, Pete Pihos, Tommy McDonald, or Norm Van Brocklin, all Hall of Famers, that didn’t get included on my list. I do go back to 1965 or so, when I saw my first Eagles game at Franklin Field. We’ll discuss that more later. My list is not in any particular order after the first two guys. Number one stands alone with no one close – BILL BERGEY. Bergey played in the NFL from 1969 – 1980. 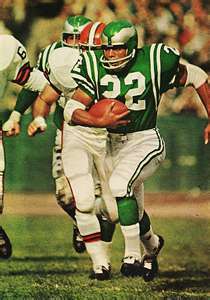 He was named to the AFL All Star team as a rookie with Cincinnati in 1969 and was named to 4 Pro Bowls with the Eagles. In my opinion, Bergey is underrated and should be in the HOF. He didn’t get the credit he deserved because he played for lousy teams while good players like Jack Lambert received much more credit because he played for the “Steel Curtain” Steelers. Bergey was just as good. Bill Bergey was “The Baddest Man in the Valley”. 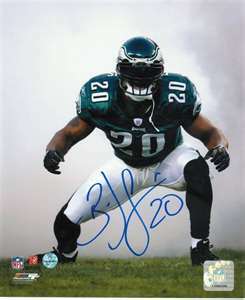 My second favorite is BRIAN DAWKINS. B-Dawk brought leadership with him everywhere he went. You could be sure of two things with Dawkins, he was going to come to play every week and he was going to hit you every time he got a chance. B-Dawk played for the Eagles from 1996-2008 which included 183 games, second only to David Akers. Including his time with Denver he has been to 9 Pro Bowls and was named NFL Man of the Year in 2008. 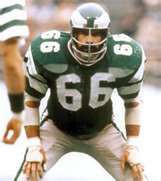 BOB BROWN – “Boomer” played for the Eagles from 1964-68 before moving on to the Rams, the Raiders, 6 Pro Bowls and the Pro Football Hall of Fame. Why Bob Brown do you ask? When I was about 7 years old, 1965, my Dad took me to Franklin Field for my first Eagles games. We used to stand in the end zone because we had passes. We were walking in to the stadium one Sunday and there stood Boomer. I have to say two things that I remember very vividly, Brown was probably the first black person I ever remember seeing and he was surely the biggest person I’d ever seen. I saw Boomer at a memorabilia show recently and told him that story and that I had always been a fan of his since. His comment to me was “I hope I didn’t let you down”. A true 1st class guy. TIMMY BROWN – This is an easy one. On November 6, 1966 we were at Franklin Field when Timmy returned 2 kickoffs, 90 and 93 yards for touchdowns in the same game against the Dallas Cowboys. At that time he was the first player to have ever done it. He still holds the Eagles record with 5 career kickoff returns for touchdowns. Brown played in the NFL from 1959 – 1968, including 1960-67 with the Eagles. He was a member of the World Champion 1960 team. Timmy made 3 Pro Bowls with the Eagles. WILBERT MONTGOMERY – Wilbert was a 6th round draft pick in 1977 and played 8 season s for the Eagles. As the Eagles became a better team and landed in the Super Bowl in 1980 it was because of Wilbert Montgomery on offense. Wilbert holds many Eagles rushing records. In his career he rushed for 6,789 yards and 57 total touchdowns. He was a 2 time Pro Bowler. Wilbert is a member of the College Football Hall of Fame. 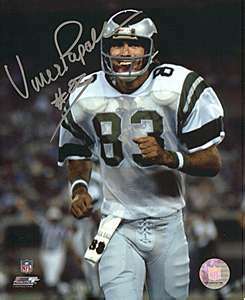 VINCE PAPALE – Vince is an easy choice as a favorite because of his storybook career and the movie “Invincible”. I’m a fan of those things too but I knew about Vince Papale from the rough touch league in Delaware County long before the Eagles. When we were 12 years old or so and playing on the 95 lb team our coaches played in that rough touch league. We were kids and went to all of the games and ran around the fields while the games were going on. Those were tough games. I’ve had an opportunity to meet Vince several times and he’s an all-around great guy. JERRY SIZEMORE – I like offensive linemen and Sizemore was my favorite. He was a 1st round draft pick, the number 3 pick in 1973 out of Texas. He played with the Eagles until 1984. Jerry’s 12 seasons on the O-Line are the 2nd most seasons played behind Chuck Bednarik. His 156 games ranks 4th among Eagles lineman. Sizemore made 2 Pro Bowls and was a big key to the emergence of Wilbert Montgomery and the run to the Super Bowl. He is a member of the College Football Hall of Fame. Sizemore never played a down in the NFL for anyone but the Eagles. JEREMIAH TROTTER – I think it was the toughness of Trotter that attracted me to him or the 3 different stints he had with the Birds. None the less Trott made 4 Pro Bowls as the Middle Linebacker of the Eagles. Trotter and Dawkins were the leaders of the defense that led the Eagles to 2004 Super Bowl. HERSCHEL WALKER – I just liked everything about this guy except that he played for the Cowboys and the Giants during his career. He was the ultimate team player with the Eagles between 1992 and 1994. In ’92, he rushed for 1070 yards. In 1994, Herschel became the first NFL player to have gains of 90 or more yards rushing, receiving and on a kick return in the same season. The man could do it all. Walker finished his career with 8,225 yards rushing with 61 TD’s and 4,859 yards receiving with 21 TD’s. He made 2 Pro Bowls. In my mind Herschel is the best college football player I’ve ever seen. He won the 1982 Heisman Trophy and is a member of the College Football Hall of Fame. ANDRE WATERS – Another #20 who just brought the hammer every time he stepped on the field. Waters was tough! Many thought he earned the nickname “Dirty” Waters but one thing’s for sure the other team knew he was on the field. 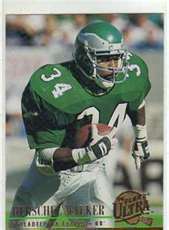 Andre was undrafted out of Cheyney in 1984 but made the Eagles and played with the team until 1993, before finishing his career with Arizona. He led the Gang Green Defense in tackles 4 years. He was the leading tackler on the 1992 team that was ranked #1 in the NFL in rushing defense, passing defense and total defense. Andre made his only Pro Bowl in 1991. MIKE ZORDICH – Another tough, hard nose player. Zordich played at Penn State, another good reason to like him. Mike was a 9th round draft pick who was originally cut by San Diego. He played for the Jets and the Cardinals before playing for the Eagles from 1994-1998. Mike played a total of 185 career games in 12 NFL season. He had 20 interceptions and returned 3 of them for touchdowns. He also had a fumble recovery for a TD for the Eagles.